Mario & Sonic at the Sochi 2014 Olympic Winter Games (stylized as Mario & Sonic at the Olympic Winter Games: Sochi 2014) is a Wii U game, and is the fourth installment in the Mario & Sonic series. It includes a variety of events from the winter games such as skiing, figure skating, and curling. As the title implies, the game is centered around the 2014 Olympic Winter Games, taking place in Sochi, Russia. Different events uses the Wii Remote Plus controller, Wii U GamePad, or both. As the other games in the series, it features realistic events with ones in Mario's and Sonic's worlds. As the game is a Wii U exclusive, Mario & Sonic at the Sochi 2014 Olympic Winter Games is the first in the series to not have a handheld version. It is also the first game in the series published by Nintendo outside of Japan and South Korea rather than SEGA, who published the first three games. The main menu, showing all 5 game modes. The game features five overall modes total. The basic mode of play where players select one event to play in. The player can change the CPU difficulty level, the music to use in events, and extra options for certain events. The number of players and the team settings are decided upon, each player selects characters to use for an event, then the match begins. Groove Pipe Snowboard's event intro screen. This screen varies depending on the event that is played. Before each event, there is an event intro screen. Events where all 4 players play at once show the VS screen, displaying which players or teams they are up against. For turn-based events, the current results screen will be shown, similar to the final results screen that shows the current running order prior to the next player or team beginning their turn. For head-2-head events, the tournament grid, showing the 4 players or teams in a tournament bracket, will be shown. For the latter two types of intro screens, these screens are shown again during the course of an event after a player or team finishes their turn in case of turn-based events, or after a round is complete in case of head-2-head events, until the final results have been determined. There are some events that put the players in teams. There are also other events that have 8 players vying for 1st place. In certain events, the results of CPU players/teams are simulated, and are shown in the current results screen before the next player/team begins their turn. The length of an event depends on how the event is played and the game settings for the selected event. The track map for Winter Sports Champion Race, that can be shown exclusively on the GamePad during Single Match. There are some events that are played without the GamePad. For these events, the Mario & Sonic Live will be displayed on the GamePad, with Toad hosting the events. Toad will comment at the start and end of events. Miis would give tips on how to play an event based off posts from the Miiverse network; due to the shutdown of Miiverse, the Penguins instead now give a preset list of tips for the event. There are some events with a track map that shows where the players are running at the moment; the map can be enlarged to fit the screen by pressing . The final result screen that is shown after an event is complete. The picture is at the end of Skeleton. At the end of an event, players are ranked based on how well they did in an event, such as how many points they earned, how fast they finished the course, etc. There are some events that grade players on various criteria from C- being the worst and A+ being the best; the letter grades are converted to points to give an overall result. If the player can place in the first 3 spots in an event, they win a medal. In Figure Skating Spectacular's 2-vs-2 mode and events where there are 4 players in one team, characters never do their individual victory animations, and characters will clap for their result if they finish 2nd or 3rd. A difference between the previous games is that this game skips celebrations for CPU players that place in the top 3, and that the ceremony is done first before the final result screen, rather than after it. After the ceremony is complete or if the player/team finishes outside the top 3, the final result screen is displayed, showing each player or team's score, which varies depending on the type of event. The player can watch the replay of a completed event by pressing . Once the player presses , the Retry menu appears that allows the player to play again, change the character or event, or go back to the main menu. There are some events without a final result screen or replay, so the Retry menu will pop up at the point where the final result screen should appear after such events. The player can see which medals they won and the best record they have set in the Select Event screen. Records can be set in events that feature them, but they can only be set in Single Player or Co-op; multiplayer versus or team battles do not allow records to be set, like the 2009 Wii game. Also from the 2009 Wii game, Best Runs can only be set in single player mode. However, certain challenges can be cleared in multiplayer versus or team battles. More details on the player's record for a specific event can be displayed in the Road to Victory channel on the GamePad. This channel allows the player to view a history of their results in the events they have participated in, the accomplishments they have made, as well as a graph showing up to 20 of the player's most recent attempts, the change in score from the first attempt to the most recent attempt, in addition to two other statistics. 1-2 Players, Team Versus or Co-op Play: The human players/teams automatically go to the Finals and players simply do 1 round to fight off for 1st or 2nd; this makes getting 3rd or 4th impossible. 3 Player Free-for-All: The seeding is determined randomly. The seeding determines who gets a bye in the first round and is guaranteed at least 2nd place. The loser of the first round gets 3rd place; the winner of that round faces off against the player that got a bye in the first round to battle for 1st or 2nd. Total length for the whole event is twice as long. It should be noted that although there are 3 players/teams in the tournament bracket when playing with this number of players and with this team setup, there are actually 4 players/teams competing; the CPU player/team will always be listed as 4th place (only noticeable in Medley Mania) despite not even appearing on the tournament bracket. 4 Player Free-for-All: The seeding is determined randomly. Two semifinal matches are played to determine who will play for 1st or 2nd and who will play for 3rd or 4th. After this, the match for 3rd place is played, followed by the match for 1st place. Total length for the whole event is 4 times longer than normal. In each round, the lower player number of the two participating players in the round will use the GamePad. Victory is given to the player with the best total score in Medley Mania after all events are complete. 4 players, either in a free-for-all or in a 2-vs-2 battle, compete in a medley to see who is the best player or team across a series of events. When playing with 3 or 4 players, a 2-vs-2 match can also be played. The game settings, CPU difficulty and the music track set for the individual events in the Single Match mode will also apply to the same events in the medley. The player can also win medals, records, and challenges in Medley Mania mode, though this can only be done during a single player session. Gameplay for events in Medley Mania are the same as in Single Match. Events usually will be played in a free-for-all; the exception is if the medley is played in 2-vs-2 mode and the event allows players to split into pairs. For events that are played in 2-vs-2 mode, the team setup for the event will be the same as the team setup for the medley. The player's objective here is to perform the best they can out of all events played in the medley against the other players. The results of all rounds that are played are tallied up to determine the final ranking for each player in the medley; the better the player does in the events, the better their final ranking will be. Before each round is a splash screen showing the medley being played, the current round number of the medley, and the event that will take place. The current medley standings are only displayed on the GamePad until the final event is complete. Before selecting a character, human players can choose whether they can have a "Handicap Bonus"; if enabled, 2 extra stars are given for each top 2 finish, meaning 6 and 5 stars will be awarded to 1st and 2nd, respectively. Note that even with this option On, there is no bonus for finishing outside the top 2. This option is not available for CPU players; it is locked to Off. In 2-vs-2 medleys, star accumulation for each event varies depending on the multiplayer formation of the event. In a free-for-all, the total amount of stars both players earn from their finish positions are added to the team's score; for 2-vs-2 events, the winning team earns 7 stars and the losing team earns 3 stars. Extra characters (as a teammate or an opponent) are chosen at random for events that feature them. However, they do not influence the amount of stars a player or team earns at the end of a round, even if a player wins or loses against them. Stars will be awarded based on only the player's results against the 3 other players participating in the medley. The amount of stars a player has earned does not determine the seeding in tournament-based events; the seeding for these events will be determined the same way as in Single Match. In addition, when 3 players are playing an event in a medley that is played in a tournament style, the CPU player will earn 1 star for the 4th position, despite not even appearing in the tournament bracket screen. At the end of a medley, the Award Ceremony scene is shown where characters are ranked based off the amount of stars they earned in each event. In 2-vs-2 mode, special winning animations may also occur depending on which characters were on the winning team, just like in Single Match. The Award Ceremony scene is still shown in 1 player mode even if the player places 4th; if that is the case, the music for 2nd/3rd place will play during the ceremony. Characters never do their losing animation in the ceremony screen if they place last (they will always wave to the screen no matter what). If there is a tie for a position, the lowest player number will always win. The Medley Mania final results screen will show a standings list of all players and the amount of stars earned. A replay of the last event that the players have competed in will be shown. If the last event of a medley does not have a final results screen or a replay, the medley's final results screen will take place after the ceremony where all action in the ceremony is frozen. In 2-vs-2 mode, it will show the teams in the medley and their total scores. The scoreboard in Medley Mania. Until the final event is over, this is the only way to view the current standings of a medley. The scoreboard shows the position and how many stars each player has accumulated over the course of the medley, and whether or not they are given a Handicap Bonus. The scoreboard is shown on the GamePad. In the case of 2-vs-2 medleys, the scoreboard will show both teams and the players in each team, the position that team is in, and the total amount of stars the team has earned. The scoreboard is always shown at the start and end of events, during events that don't use the GamePad, and during the Award Ceremony scene; for events that use the GamePad, the scoreboard will be hidden for the duration of the event until the Final Results screen. For events that do not use the GamePad, the scoreboard will replace the live TV screen and the track maps for racing events that feature them. The player can play in 8 pre-made medleys, plus one user-made medley. The player can create a custom medley by pressing the Edit button, and selecting from 2 to 5 events that the player wants in their medley. is used to remove events from the medley. Note that the order the events will be played in is based off the order the player has picked the events in the Select Event screen, so will need to be used if the player wants to change the order the events are played in. Once the player has chosen the events they want in their custom medley, the player presses the Save button to finish. Players can compete against up to 3 other friends or players around the world online. There are always 4 players in a match, if less than 4 players gather up at the conclusion of the entry period, the rest of the field are filled with computer players. Note that when playing with friends, only players that are friends with the user of the first player's console can join. Competing in online matches raises a player's Strength Points, which helps contribute to their selected country's ranking. However, losing matches has a chance to lower a player's Strength Points. The Strength Points are shown after going past the event results screen, and it will show whether that value has increased or decreased. The rank for the player's country in each event is shown before the player selects an event to compete in. "Twenty contenders from the worlds of Mario & Sonic join forces to compete in Legends Showdown." "To come out on top and win the Legend Trophy, they must triumph over tough opponents." "The contenders split into teams of four and compete in events that take place in five areas." "Emerge victorious to take home the illustrious Legend Trophy! The player competes on all events in the game, which are split into 6 areas. The player earns points based on how much they win an event by; the higher the margin, the more points earned. The maximum amount of points possible in an event is 1,000; the minimum points the player can win is 200 for most events. Friend AI can also appear, and also are worth 500 bonus points for that area if one should appear. During an area, the points the player earned from events can be seen on the GamePad; once an area is complete, the TV screen will display the amount of points earned in each event. A rank will also be given with A+ being the best and C- being the worst, which depends on the number of points scored in that area. In each area, the player selects a character from the 4 available from each area. In each event except the last event of each area and in events where a Friend AI takes over, the player competes against a dark form of the player's selected character, in which their name in-game is listed as three question marks. The last event of an area involves fighting a rival. In all events, the player must simply redo the event if they lose. Records can also be set in events played in Legends Showdown. The characters and events for each area, as well as the rivals for each of the final events, are shown. Characters are Yoshi, Donkey Kong, Sonic, and Tails. Characters are Waluigi, Wario, Knuckles, and Amy. Note: Magikoopa is called Kamek in European/Australian versions of the game. Characters are Daisy, Luigi, Shadow, and Vector. Characters are Mario, Peach, Silver, and Blaze. Characters are Bowser, Bowser Jr., Dr. Eggman, and Metal Sonic. Note: Records cannot be set on Figure Skating Spectacular in Legends Showdown as this is programmed as a 4 vs 4 event; they can only be set in 1-player mode on Single Match or Medley Mania. The player selects any of the 20 characters and competes in Winter Sports Champion Race against Eggman Nega, Dry Bowser, and Rouge. When the player finishes the event in 1st place, they clear the mode and the credits will play. The Action & Answer Tour victory screen. The winner is the player with the most points. This mode is about playing in Olympic Events with questions thrown in within the events and answering them. The players compete for points by travelling to a number of different venues and answering questions that occur in the middle of events. The player can choose to play 4, 6 or 8 rounds. Each round is an event, which is mostly determined randomly. There are some random events that can happen during gameplay, which can occur either before or after a minigame. A random minigame is selected based on where the event takes place in. The title for each minigame is usually named "(description) & Answer". A minigame with the same title may not necessarily be played the same way, depending on the question that is asked for the minigame. The multiplayer formation for the minigame may not necessarily be the same as the multiplayer formation of the event that is being played. Players play the event according to the minigame's rules and score points based on their results. The player can view the tutorial for an event, or practice an event before trying it out for real. The way a player inputs an answer to a question varies depending on the event and minigame. After the end of all the rounds, the player with the highest score wins. If there is a tie for 1st, a tiebreaker question is held among the players that tie. If three or more players tie for 1st, a tiebreaker question will only determine the winner; all other players receive 2nd place. If there is a tie for 2nd or 3rd place, it will not be broken and the players that tie share that position. A point system is used to determine the winner in Action & Answer Tour. There are some minigames where all players are always correct, even if they finish with a score of 0 on that minigame. There are other minigames where points are solely based off how many points they earned in the minigame, and there are also extra chances to earn more points depending on what happens in the game. When it is the final round, the amount of points the winner can earn changes to a number between 12 and 28, which is based off the sum of the displays of all players, which range from 3 to 7. If the last minigame can award partial points to players, the amount of points that would be earned normally, multiplied by one-tenth the maximum amount of points possible for that round, would be the amount of points the player would earn for that round; if the result is not a whole number, it is rounded down. The scoreboard in Action & Answer Tour. The scoreboard in Action & Answer Tour shows the position and how many points each player has accumulated over the course of the game, which is shown on the GamePad. The scoreboard is always shown at the start of a match, during intermissions, for events that don't use the GamePad, and at the end of a match; for events that use the GamePad, the scoreboard will be hidden for the duration of the event until the event ends. The game features 16 Olympic events total. The game has eight total Dream Events. The game features a total of 21 playable characters. All playable characters in this game are identical to those featured in the Wii versions of the previous two installments. As with the previous games, there are a variety of collectable costumes for the player to use for their Mii character. All the costumes from Mario & Sonic at the London 2012 Olympic Games return (with the exception of the Wenlock Costume, being replaced by the mascots of the new Olympic games). The method for unlocking them is different also; instead of buying them from a shop using in-game points, they are obtained by completing specific challenges (the same applies for all unlockable music, which exclusively includes music from past Mario games and past Sonic games). Here is a list of costumes and their unlocking requirements. Princess Peach Get over 75% synchronization in Mario’s Figure Skating Spectacular with three other players. Princess Daisy Finish first with a lead of at least three seconds in Snowboard Cross. Bowser Finish first in Winter Sports Champion Race after switching to all for sets of gear. Bowser Jr. Play all events in Action & Answer Tour. Wario Reach a top speed of 120km/h in Alpine Skiing Downhill. Waluigi Win Medley Mania at least once. Yoshi Get over 90% perfect in a single Mario’s Figure Skating Spectacular. Birdo Perform a jump from the Wiggler Bus at least 2 times in a single Groove Pipe Snowboard match. Donkey Kong Take all shortcuts in a single Groove Pipe Snowboard match. Diddy Kong Complete 3 areas in Legends Showdown. Dry Bowser Collect at least 35 rings in a single Roller Coaster Bobsleigh match. Dry Bones Score at least three bonus goals in a single Snow Day Street Hockey match. Fire Mario Get an A+ rank in half the areas in Legends Showdown. Bee Mario Complete 200 challenges. Propeller Mario Complete 4 areas in Legends Showdown. Penguin Mario Upload results to the rankings for any event. Toad Play Medley Mania at least once. Larry Koopa Get at least 65% puck possession in a single Ice Hockey match. Morton Koopa Jr. Get at least 65% puck possession in a single Snow Day Street Hockey match. Wendy O. Koopa Perform a perfect boost at least 10 times with at least three other players in 4-man Bobsleigh. Iggy Koopa Perform at least 9 rocket boosts in the Bullet Bill Sledge Race. Roy Koopa Play an even 50 times. Lemmy Koopa Win Action & Answer Tour at least once. Ludwig von Koopa Perform a special boost at least 4 times in a single Short Track Speed Skating 1000m race. Sonic the Hedgehog Complete the last area in Legends Showdown. Miles "Tails" Prower Perform 8 perfect combination moves in Figure Skating Pairs (2 players only). Knuckles the Echidna Play an event 100 times. Amy Rose Ride the boost line for a total 30 seconds in a single Skeleton match. Dr. Eggman Perform a perfect landing at least 6 times in a single Roller Coaster Bobsleigh race. Shadow the Hedgehog Get at least 20 perfects in a row in a single Speed Skating 500m race. Silver the Hedgehog Get over 90% perfects in a single Figure Skating Singles match. Metal Sonic Perform at least 9 tricks in a single Freestyle Skiing match. Blaze the Cat Set a lap time of under 11.5 seconds for at least three laps in a single Short Track Speed Skating 1000m match. Vector the Crocodile Get a perfect at least 14 times in a single Snowboard Slopestyle match. Rouge the Bat E-123 Omega Get a perfect balance rate at least 60% in a single Snowboard Slopestyle match. Charmy Bee Espio the Chameleon Perform a flag boost at least 12 times in a single Snowboard Parallel Giant Slalom match. Big the Cat Super Sonic Play events over 200 times. Tikal the Echidna Marine the Raccoon Get a total distance of over 10,000m in Ski Jumping Large Hill. Emerl Take over 15 shots at the goal in a single Ice Hockey match. Werehog Score 4 points in one end of Curling. Chip Get a gold medal in the 16 Olympic Events. Egg Pawn Perform a jump with maximum revolutions in Figure Skating Singles. Leopard Set a new record in any event. Polar Bear Get first place in seven events. Most of the songs used are from past installments. Mushroom Bridge from Mario Kart: Double Dash!! A * notes that the song appeared in a previous title, but wasn't a customizable song. For this subject's image gallery, see Gallery:Mario & Sonic at the Sochi 2014 Olympic Winter Games. 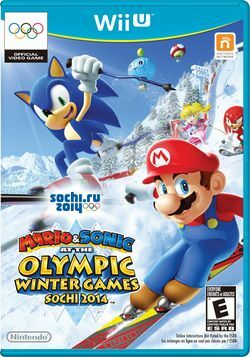 Mario & Sonic at the Sochi 2014 Olympic Winter Games received mixed reviews from critics. IGN gave the game a 4.5 (a "Bad" rating). They praised its large quantities of unlockables, but criticized its lack of games to be played online. GameXplain gave the single player mode a 3/5 stars and its multiplayer a 3.5/5. Destructoid gave the game a 6.0. The game received a score of 49% by Official Nintendo Magazine - while they praised the game's "TV-show-style to menus and games", they criticized the controls (describing them as "almost universally abject") and the event gameplay. Danielle Riendeau, Polygon 6/10 "While its dream events are colorful and fun, Sochi 2014 suffers from an overall lack of depth. Sochi 2014 boasts plenty of variety, and the game was great for multiplayer matches with a mixed group, where that simplicity was a boon. But the novelty of figure skating as Donkey Kong wears thin quickly — and Sochi 2014 is simply too lightweight to be a contender." Martin Gaston, GameSpot 5/10 "The Mario & Sonic series is the perfect example of the kind of charming, bite-sized, and all-inclusive entertainment that defined Nintendo throughout the Wii's golden years, but a lack of creativity and a poor implementation of the Wii U GamePad ensure that Mario & Sonic's fourth outing in six years fails to secure a podium finish." Scott Thompson, IGN 4.5/10 "Mario & Sonic at the Sochi 2014 Olympic Winter Games has some of the best online capabilities on the Wii U, but it unwisely forces use of poor motion controls in almost every mode. For all its competitive elements, including leaderboards, online multiplayer, and downloadable ghost competitors, Sochi 2014 is just too unpredictable to make good use of any of them. There is some fun to be had in both local and online multiplayer, but half of that is the comedy of playing with terrible controls." This is the first Mario & Sonic game not to have a handheld counterpart. This is the first Mario & Sonic game to have online multiplayer. The game features some special animations to some Paired Characters for whenever the player gets first place in a event (for example, Mario and Princess Peach have different animations together rather than Luigi and Princess Daisy who have no special animations together). This page was last edited on April 8, 2019, at 14:54.